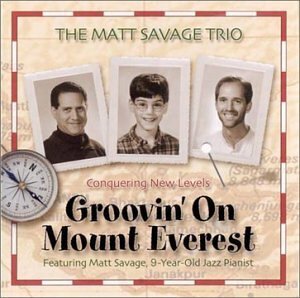 Groovin’ On Mount Everest is The Matt Savage Trio’s first studio recording. It contains over an hour of original compositions by 9-year-old pianist/leader Matt Savage, along with two standards by jazz greats Duke Ellington (‘Satin Doll’) and Harburg/Arlen (‘Somewhere Over The Rainbow’). The two adult members of the trio are John Funkhouser (bass) and Steve Silverstein (drummer). At the age of three, Matt was diagnosed with Pervasive Developmental Disorder, a high-functioning type of autism. Selections: Groovin' On Mount Everest; Forty-Seven; Somewhere Over the Rainbow; Anybody Home? ; A Cat's Tenth Life; This is Your Conscience; Satin Doll; Bossy Nova; Shufflin' The Cards.